Reduced Gravity Office’s Orion Crew Survival Systems Mockup Ingress Research flights. Flight 3. November 24, 2015 – NASA is testing the spacesuits being developed for Orion on the agency’s C9 aircraft, which can fly a series of parabolas to simulate a weightless environment for brief periods. 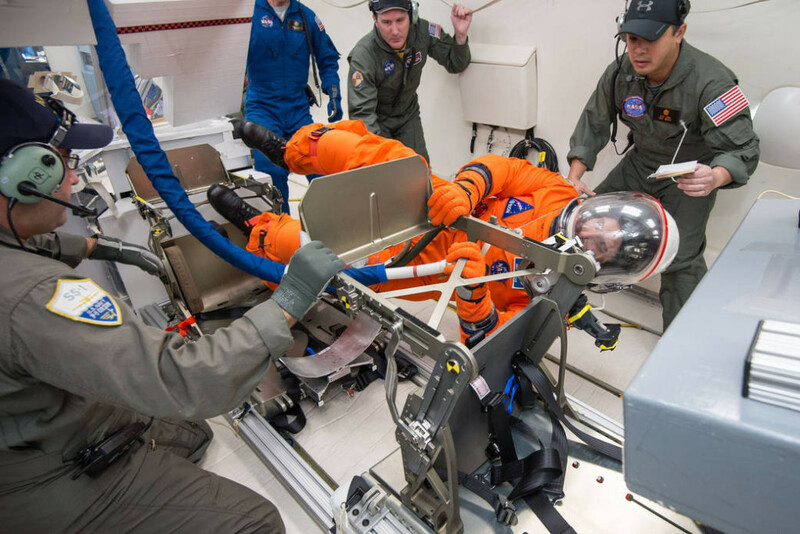 Engineers are using a mockup of Orion’s cabin in the aircraft to evaluate how astronauts can get into their seats during various operational scenarios, perform tasks at different suit pressures, and to test seat hardware. The suit, known as the Modified Advanced Crew Escape Suit, is an upgraded version of the launch and entry suits worn by space shuttle astronauts. As NASA plans human deep space missions, including a voyage to a relocated asteroid, care is being taken to efficiently use space inside Orion. The white Extravehicular Mobility Unit spacesuits used by crews to conducts spacewalks on the International Space Station are too bulky to carry in the spacecraft, so NASA is altering the ACES suits for multiple uses both inside and outside the spacecraft. The crew escape suit, along with Orion, will contain all the necessary functions to support life and is being designed to enable spacewalks and sustain the crew in the unlikely event the spacecraft loses pressure. Through a series of tests, engineers are learning what features need to be included to improve the suit’s mobility beyond the needs of the trip from the launch pad to space and its return to Earth, such as enhanced gloves and elbow joints with improved mobility for spacewalks.